Agent is well known person in the commercial business parlance. The GST Law also talks about Agent as ‘agent’ means a person, including a factor, broker, commission agent, arhatia, del credere agent, an auctioneer or any other mercantile agent, by whatever name called, who carries on the business of supply or receipt of goods or services or both on behalf of another. Note : The valuation Rule 33 of CGST Rules, 2017, only speaks about exclusion from value of supply only in case of “Services”, it does not hold for goods. In case of goods, Rule 29 of CGST Rules, 2017 will prevail. E.g..- Corporate services firm Mr. Supplier is engaged to handle the legal work pertaining to the incorporation of Company A. Other than its service fees, Mr. Supplier also recovers from Mr. Service Recipient, registration fee and approval fee for the name of the company paid to the Registrar of Companies. 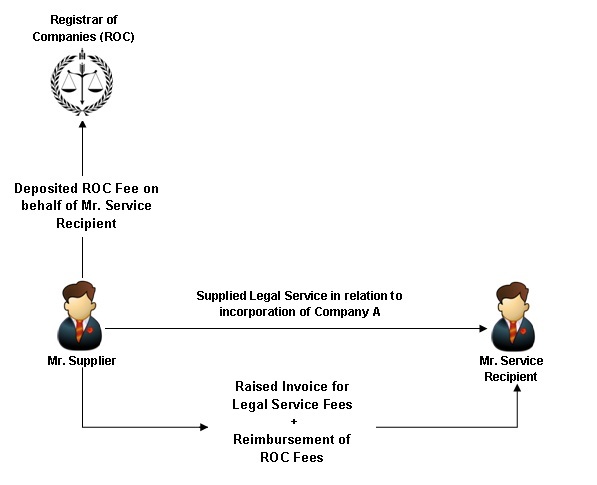 The fees charged by the Registrar of Companies for the registration and approval of the name are compulsorily levied on Mr. Service Recipient. Mr. Supplier is merely acting as a pure agent in the payment of those fees. Therefore, Mr. Supplier‘s recovery of such expenses is a disbursement and not part of the value of supply made by Mr. Supplier to Mr. Recipient. is the franchisee of petroleum companies i.e. petrol retail outlets come under the purview of the pure agent, since they entitle for commission only for sale of diesel and petrol, but they purchase the same from from oil companies paying cash. We are DDCS, we deputed few employees in one of the related company i.e NTT Security..